Acer has revealed the world's first 15-inch, 2-in-1 Chromebook, the aptly named Chromebook Spin 15, for 2018 during its 'Next@Acer' keynote event held in New York City. The laptop brings size to Acer's 2-in-1 Chromebook line as well as claims of immense battery life to the tune of up to 13 hours. Furthermore, it appears that Acer has accounted for convertibility in every aspect of the laptop's design. For one, the device touts top-firing speakers, and the 15.6-inch Full HD (1,920 x 1,080) IPS touch display is behind Corning Gorilla Glass. Of course, the Chromebook supports the Android Google Play Store like all touch-based Chrome OS devices. Plus, this is an awfully light 15-inch laptop at just 4.63 pounds or 2.1kg, so it embodies the tablet experience and portability that users crave from 2-in-1 laptops. As expected, Acer Chromebook Spin 15 is powered by your choice between three Intel processors, from two dual-core Celeron chips to a quad-core Pentium CPU. That's supported by 4GB to 8GB of memory and 32GB to 64GB of eMMC storage. Of course, that 15-inch frame leaves room for a glut of connectivity options, including USB-C and a microSD card reader. The Acer Chromebook 15 starts at $449 or £499 when it lands in stores and online this July. On stage, Acer also teased a 13-inch version of the device, the first-ever Chromebook with Intel's 8th generation processors inside, aimed for business use. However, Acer has yet to reveal pricing and availability. 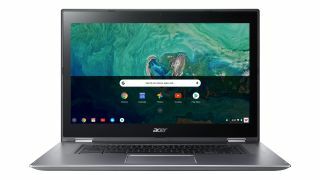 Acer has also refreshed its Chromebook 15 model with new hardware inside for a much better price. This new version brings forth the same Full HD display (with your choice of touch control) and a claim of up to 14 hours of battery life on a single charge. This straight-up laptop version also brings forth access to the Google Play store and is powered by your choice of the very same processor, memory and storage options as the 2-in-1 version. Not to mention that it too includes USB-C connectivity. Just like the business-focused, 13-inch version of the Chromebook Spin 15, the standard Chromebook 15 has a 13-inch-inch counterpart as well, though pricing and availability details are not yet available. The Acer Chromebook 15 for 2018 starts at $349 or £399 when it lands in stores and online later this month.